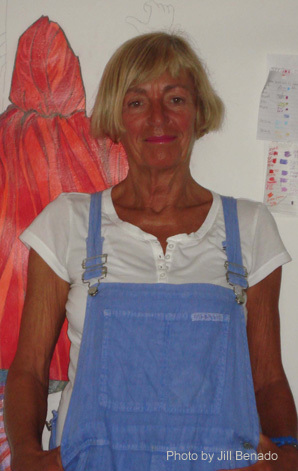 Bridget Jackson studied Fine Art at Goldsmiths College, London in the late 1960s. Following graduation she taught at a variety of colleges of art, design and architecture before becoming Principal of Chelsea College of Art & Design. She left Chelsea in 1997 to re-establish her studio in South-West London. She now works full-time as an artist. Her work is usually large-scale, involving layering of colours that are burnished to produce a smooth surface. She uses oil pastel, pencil and gouache. The overt subject-matter is clothing, either on its own or worn by a manikin.